In China, the place has become too crowded and people are using up natural resources, polluting the environment with fuels and chemicals. If this country continues destroying the environment, lives on earth will not survive eventually. We know that if many trees are cut down, forests will disappear. Yet, we continue to use powerful machines to cut down more and more trees. We have noticed that all kinds of factories discharge pollutants into the air. But we ignore this phenomenon, because we want to get a higher GDP. Actually, China became rich at the expense of the environment. As a result, air pollution is one of the major problems in China. A great deal of energy is needed to run the factories of modern industrial nations. Automobiles, trains, planes and busses need energy, too. Nearly all of this energy is produced by burning fuels and oil. The burning produces wastes, some of which remain in the air, causing air pollution. According to the Ministry of Environmental Protection, 8 out of 74 big cities in China failed to meet the air quality standards in 2014. Sadly, however, the result actually shows improvement from a year before. In 2013, just 3 out of 74 cities met the standards. Chinese authorities recently announced a war on air pollution and started to eliminate industrial capacity and reduce coal consumption. Scientists are finding ways to stop air pollution, especially in big industrial areas and densely-populated cities, like Beijing and Shanghai. 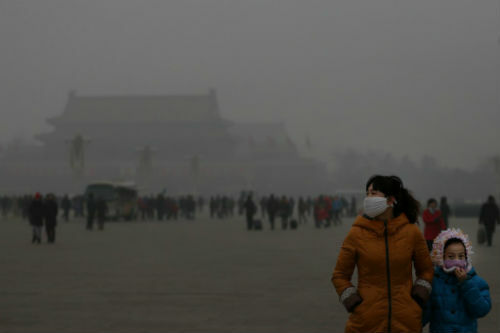 In fact, the most seriously polluted cities are the ones that are close to Beijing, the capital of China. The Government is studying new ways of generating electricity that may be less damaging to the environment. Aside from preferring cleaner energy sources, some of cities will be limiting the number of vehicles on the road. In the meantime, many power plants are being modernized to give off less polluted material. Also, Chinese Engineers try to design and locate new power plants to do minimum damage to the environment. We know that if the population continues to rise at the present rate, the problem will not be solved. The Chinese Authorities need to think about the problems and then take actions to protect the country and have a better and cleaner planet in the future. Now China is struggling between cutting down pollution and developing the economy. The Government pledged that it will be cutting it carbon emissions by the year 2030 and the record seems that the country is keeping its words. Unfortunately, Chinese people and authorities might still have a long way to go before they have a ’clean’ home. This country is using heavy amount of coal for its needs and is one of a number of countries releasing coals and it will stay like that for a while. However, there are people who are concerned about the environment and are trying to prevent air pollution, even if it means a slower economy. In the end, the country will figure out how to control pollution and co-operate with nature. * The author was an exchange student studied at Chonnam National University during the fall semester of 2014.